The AUSA Dix Chapter hosted a Professional Development Luncheon at Tommy B’s Conference Center, Joint Base McGuire-Dix-Lakehurst, N.J. There were over 50 attendees including AUSA members Col. (R) Dennis Dougherty, president, Northern N.J. Chapter, and First Region president; Command Sgt. Maj. (R) Arthur Maggs Jr., Dix Chapter president; Command Sgt. Maj. (R) Jack Chlapowski, Monmouth Chapter vice president for education; and Charles Seal, Monmouth Chapter newsletter editor. The guest speaker was retired Sgt. Maj. of the Army Kenneth O. Preston, AUSA vice president for noncommissioned officer and soldier programs. Preston presented information on the Army’s NCO Professional Development System addressing the three pillars of leaning throughout a soldier’s career: institutional training, operational assignments and self-development. Retired Sgt. 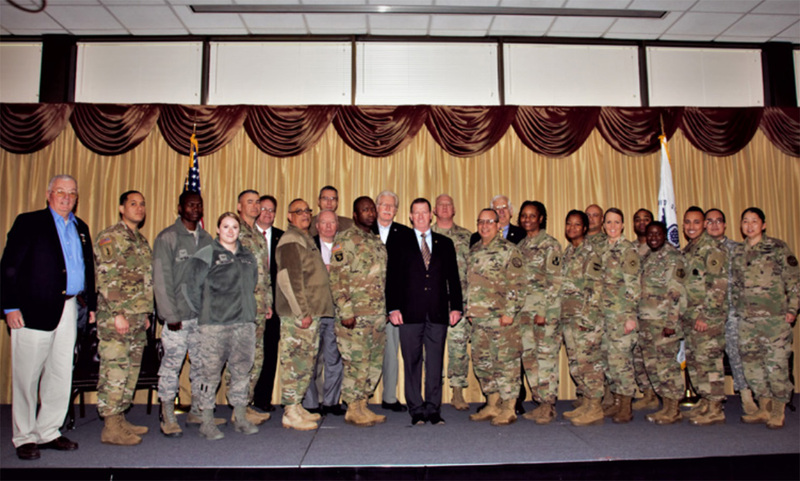 Maj. of the Army Ken Preston, AUSA vice president for noncommissioned officer and soldier programs, center, spoke at the chapter's Professional Development Luncheon. “NCOs at the lowest levels deployed across the nation and around the world make decisions today that have strategic-level impacts on our nation,” said Preston. Beginning with a discussion of the six levels of institutional training from the Basic Leader Course to the Nominative Leader Course, a two-week strategic leader development course designed to prepare nominative command sergeants major and sergeants major for their future duties serving commanders at the one- and two-star Army commands. Preston also addressed the six levels of 40-hour Distributed Learning Courses (DLCs) I thru VI placed before each of the resident courses soldiers could attend depending on their length of career service. The Army will enroll all soldiers in DLC I after graduating from Initial Entry Training and upon their arrival to their first duty station. DLC I must be completed prior to the soldier’s attendance to the Basic Leader Course (BLC). The Army will capture soldier performance during completion of the 40-hour DLC I on the Academic Evaluation Report during attendance to BLC. DLC II must be completed prior to attendance to the Advanced Leader Course, DLC III prior to the Senior Leader Course; DLC IV prior to the Master Leader Course; DLC V prior to the Sergeants Major Course; and DLC VI prior to the Nominative Leader Course. The continuation of learning beyond the Sergeants Major Course continues the life-long learning needed to develop our most senior NCOs for 2020 and beyond, he said. As part of the professional development system Preston addressed the opportunities provided by operational assignments to broaden and further develop the talent of NCOs as they progress through the ranks to the senior levels of our Army. “Operational assignments are the largest pillar of development and learning for our NCO Corps,” Preston said, adding, “broadening assignments like training NCO, master gunner, recruiting and instructor further expand and develop leadership and communication skills beyond operational assignments. Following the presentation, there was a lively question and answer session. The Army’s objective is to educate soldiers, so their potential is maximized for the capability they provide to their assigned organizations and commanders. The value of the skills learned throughout a soldier’s service, from four years through 30 years, is further maximized through their contributions in the private or public sector, and as leaders in our communities.